In a hot big-bang universe, an event of great importance occurs when the temperature of the universe cools enough (due to its expansion) to allow for electrons and protons to form neutral atoms. This is known as the era of ‘re’-combination (a misnomer because neutral atoms never existed before this time, but the term survives) and occurs at a redshift z ~ 1100. Interestingly, this also leads to the creation of what we see as the cosmic microwave background. For a some-what unknown time following recombination, the universe lived in a state with mostly neutral hydrogen and helium (the dark ages); however, sometime around z ~ 15, energetic objects formed to produce enough energy to re-ionize the universe by z ~ 6. Figure 1. showing a model SED of a z = 8 star forming galaxy, a SED of a type of contaminant, and transmission function of the filters available. Typically, neutral hydrogen can absorb photons only at certain energies corresponding to the energy level differences within the atom. An example is photons with a wavelength of exactly 1216 angstroms known as the Lyman-alpha line, which corresponds to the transition between the n=1 and n=2 levels. However, the spectrum emitted by a galaxy is redshifted as the photons travel through our expanding universe. This means that a range of wavelengths in the observed spectrum will have at one point in time (and space) have had this wavelength; thus there will a gap in the spectrum where the light has been absorbed by the IGM. This is known as the Gunn-Peterson trough. But WAIT! The edge of the trough at longer wavelengths corresponds to the redshifted original lyman-alpha line. By identifying galaxies which exhibit this feature in their spectra, we can estimate their redshift! Example: if we observe the edge of the trough to occur at 7000 angstroms, using the equation for redshift, , we can say that the galaxy is at z ~ 6. A complicating factor arises when we consider that these galaxies are VERY faint. This is important because it means that collecting spectra of these objects is very difficult, if not impossible, given current telescope and detector sensitivities. A workaround is achieved by taking images of a field of galaxies in many different pass bands (color filters). This is a way to create very rough spectral energy distributions (SEDs) of the objects in the field. A Lyman-break galaxy can be identified by looking for galaxies that are visible in longer wavelength filters, but are missing from lower wavelength filters. If you know what redshift you would like to target, you can use filters that bracket the wavelength you expect the lyman-break occur at given that redshift. Figure 4. Thumbnail images of high redshift candidates in bvizYJH filters. In total, the authors find 24 Y-drop candidates in their sample which, if spectroscopically confirmed would fall within a z ~ 8 – 9. They also are able to fit both and of the UV Schechter luminosity function. (Please refer to the original paper regarding their method used to determine the luminosity function.) The authors confirm there is a significant evolution of the function from z = 3. In particular, there are fewer UV-bright galaxies at z ~ 8 – 9 than in present day universe. 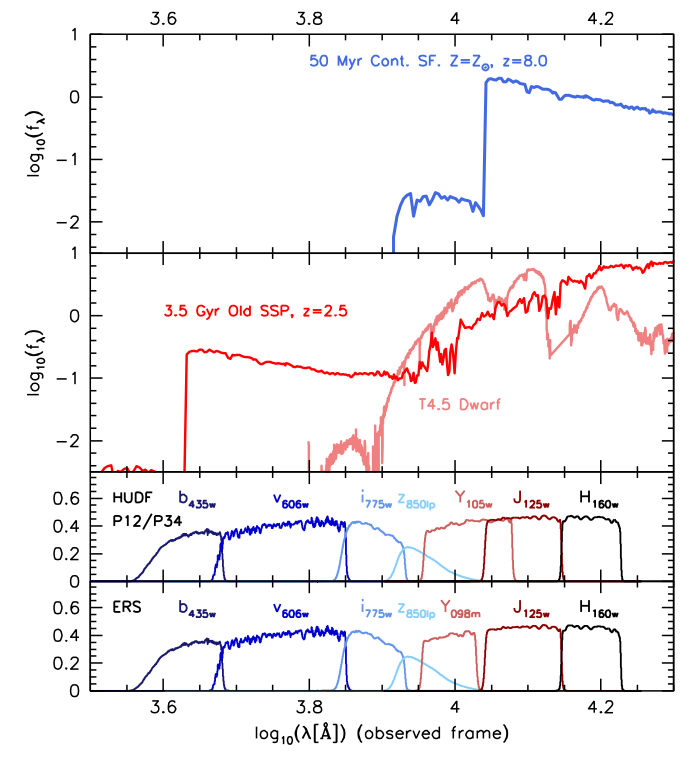 Their study also reveals that the candidates with z ~ 8 – 9 do not provide enough ionizing flux to re-ionize the Universe; however, they mention that fainter galaxies falling below their detection limit likely account for a significant UV contribution. If this is the case, then more faint galaxies are needed to account for the needed flux than predicted by a faint end slope of a Salpeter Initial Mass Function. These findings may have to wait for confirmation from observations made by the James Webb Space Telescope. 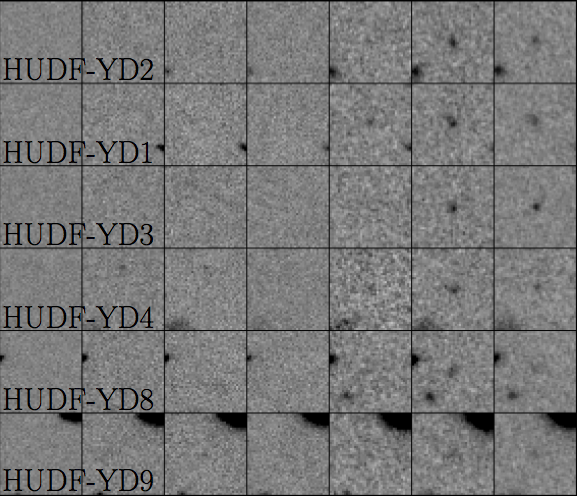 Galaxies have been detected at z ~ 10…… Far out!